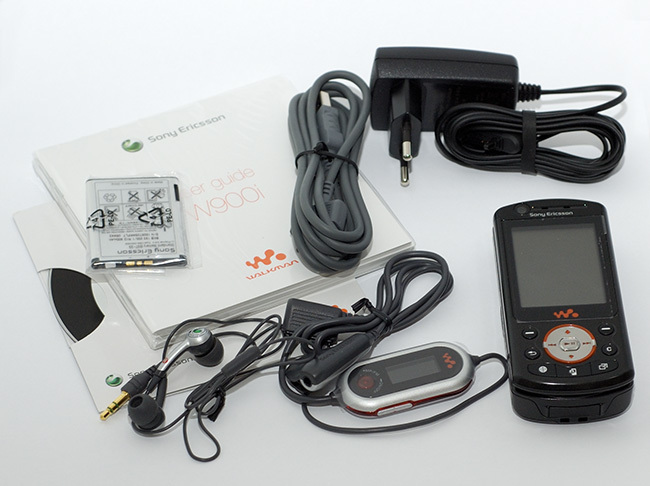 The W900 is the latest high-end Walkman model from Sony Ericsson. In addition to its music features, this phone also has UMTS/3G for making video calls, a 2 megapixels digital camera and has 3D hardware accelerator for the latest 3D Java games. Included in the package except for the W900 you will find a charger, HPM-80 headset, battery, USB-cable, CD-ROM with the communication software PC-Suite and Windows drivers and a simple user manual. 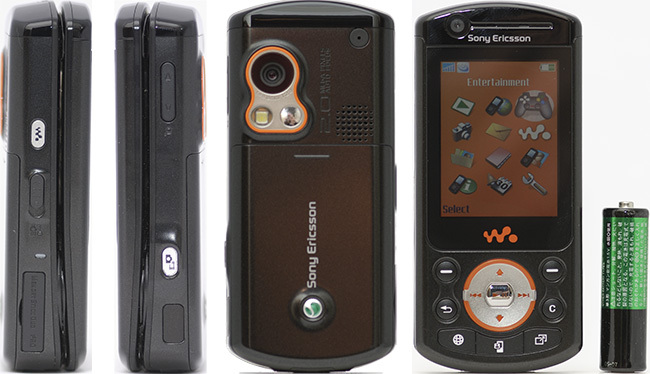 Sony Ericsson W900 (W900c in China and W900i in the rest of the world) is the most powerful phone in the Walkman range. It is a swivel model which means that the keyboard is hidden behind the display when the phone is closed. To access the keyboard you have to turn half the phone 180 degrees. The swivel must be closed the same way it was opened. Sony Ericsson W900 is a large and heavy phone. It is comparable to the older Sony Ericsson S700 but weights 10g more and the plastic material does not make it look very exclusive. On the front of the phone you will find a tiny camera which only is active during video calls and when the camera is set to self-portrait mode. Below the display there are two softkey buttons, a return/back-button, cancel-button, a dedicated browser button, video call button and a button which leads to a customizable shortcut menu. Finally, the round middle 5-way navigation key is used for navigating the menus in addition to control the Walkman application when this is active. On the left side of the phone there is a direct access button to start and stop the Walkman application. The phone is multitasking when you listen to music and the Walkman application can run in the background while you for example look up a contact to find a phone number. It will automatically pause when you receive phone a call and it starts up again when the conversation is finished. The same thing happens if you listen to the radio. A lock-device button is also found on this side. In addition to lock the keys, this button also controls the camera light. On the opposite side, you will find the camera shutter button as well as volume control and the window for the infrared connection. Both the Walkman- and camera button must be pushed in for a second or so to start the respectively applications. W900 has a protective glass covering the display and a small area around the display. I do not know the material of the protective “glass”, but it sure helps shield the display from scratches. On the backside there is a small area where the flash light, a self-portrait mirror and the 2 megapixels camera are located. The camera does not have any kind of lens protection which could result in scratches to the lens glass. I have experienced that this not is a big problem. The challenge is to remember to wipe out fingerprints from the lens before you take a picture. Photos tend to be blurry if the lens is covered with grease. This is not easy to see when previewing the photos on the phone display, but you will see them when you have transferred the images to a computer and view them in full size. W900 has a quite good 2 megapixel camera with auto-focus. Sony Ericsson has not documented much of the technical details, but during the test we managed to extract the minimum and maximum shutter speed and ISO sensitivity. The main camera can capture pictures with 160x120, 640x480 and 1632x1224 pixels resolutions. The portrait camera facing the holder of the camera has only one resolution of 160 x 120 pixels. Captured photos are saved as JPG files in Normal and Fine quality which can be translated to quality of 50% and 95% when saving a JPEG file in Photoshop. A test using the same motive but different compression settings shows a 36 percent increase in file size from Normal (336 Kb) to Fine (458 Kb). Light sensitivity is automatically adjusted by the camera application. Shutter speed and ISO value can not be set by the user but it is possible to change the exposure compensation to between -2 and +2 in 0.3 steps. The main camera has 80-800 ISO sensitivity and can vary the exposure time within the range 1/3 – 1/6400. F number is fixed to f/2.8 which means that the W900 do not require much light. If you do need more light and the subject is close enough to be enlightened, it is easy to turn the camera flash on using the lock switch. Well, it is not really a flash, but a small led light located next to the lens. The video call/self-portrait camera is a low resolution camera delivering a 176 x 144 maximum video resolution and a 160 x 120 pixel picture resolution. The ISO range for this is 200 – 1600 and means that it is capable of recording with less light than the main camera. W900 has a 8x digital zoom on the main camera while the video camera has 2x digital zoom. I don’t see the point in having digital zoom on cameras because even a computer with the most basic image editor software can do the same thing. 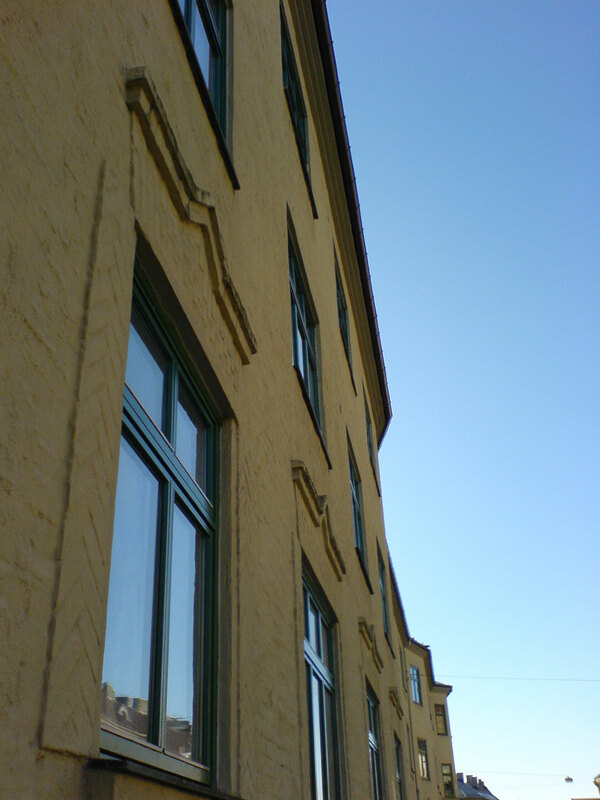 In contrast to some of the older Sony Ericsson models, it is possible to capture pictures before the camera has found correct focus. Press the shutter button half way down to focus and press it fully to take the picture. W900 focuses faster than its predecessors, and the focus speed can now be compared to older stand-alone digital cameras. Testing the camera start-up time shows us that the W900 is slow. It took around 5 seconds from pressing the shutter button, waiting for the application to start, finding focus and capturing a picture. The time taken from you press the shutter button until the picture is taken is approximately 1 second. The selectable shutter sound is played a short time before the actual photo is taken. This is very annoying. When human subjects hear the sound, they might stop smiling and turn away resulting in a faulty portrait photo. The display works as a viewfinder just like any other modern camera phones. This works well despite the fact that it is a small delay between lens input and display output. When the camera button is pressed half way down, all information about the camera settings disappear from the display and a focus square appears. 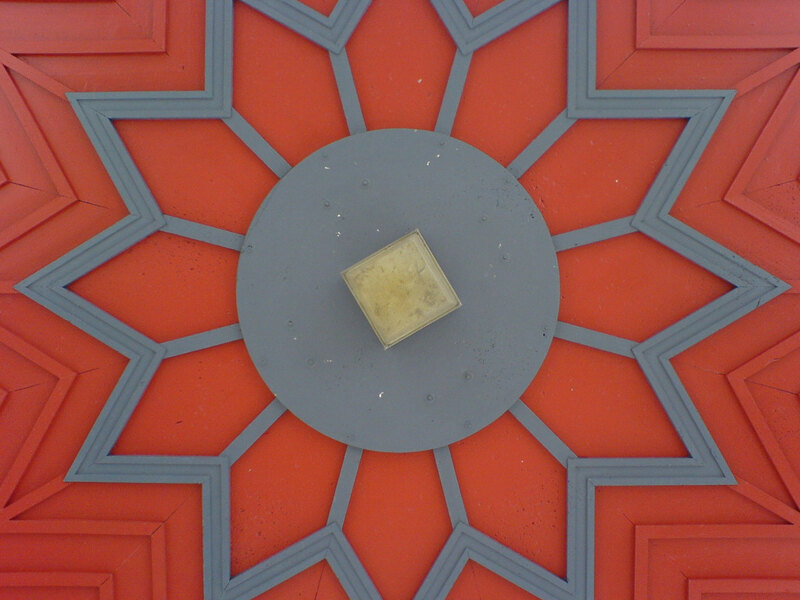 Correct focus is found within this square frame and it will change colour from white to green when this happens. A short beep also tells you that the focus is found. Pressing the shutter button all the way in will capture the photo. Sony Ericsson W900 use the Cyber-Shot camera menu also found in Sony Ericsson K600, W550 and W600. Less file compression with the Fine quality. When saving file in Photoshop Normal equals 50% quality and Fine equals 95% quality. Setting to adjust and improve the colour to suit the lighting conditions. Panorama let you take 3 pictures in a row, and merge these into 1 wide picture. Frame setting adds one of the 15 pre-installed frames to a photo. Burst captures 4 photos in a row. Self-portrait uses the video camera for taking pictures. Maximum image size is 640x480 for all these setting except Normal where it is possible to use the 1632 x 1224 pixel resolution. Less light is needed, but pictures get more noise. Adjust exposure to the centre of the picture, marked by a cross. Useful e.g when taking a picture of a person against a light background. This setting is only visible when you have selected "Self-portrait" from the Shoot menu. The picture will be mirrored. "For picture message", where the maximum recording time is 10 seconds. This ensure that the video clip fits in a picture message. 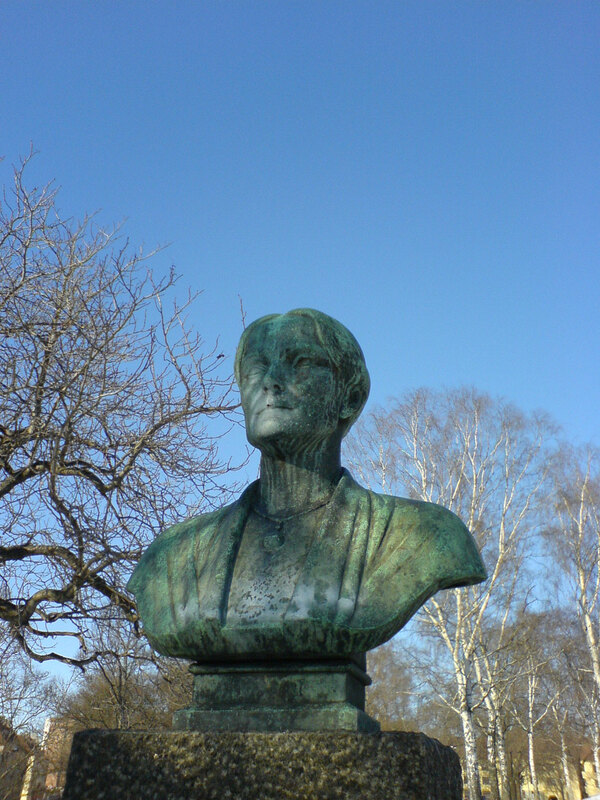 The "Normal" setting does not limit the recording and "Self-portrait" uses the video camera for recording. The other possible settings during video recording are: Auto focus, Night mode, Light, Effects, White balance and Spot photometry. Se photo table above for possible settings. Resolution during normal video recording is 320 x 240 pixels. The column to the left are pictures taken with a Digital SLR 6 MP resolution camera using a 45mm lens and the column to the right is photos taken with a W900. Click on the W900 example pictures below to see the original photo. W900 was the first Sony Ericsson model with 3D accelerated hardware. This hardware speeds up advanced Java games and is also the most likely reason why video recording is so smooth. Three Java games are installed. One simple 2D Tetris variant and two 3D Java games where the Sony Ericsson innhouse creation PowerBall Arcade make use of the 3D accelerated hardware. Edit: We have been informed that only the PowerBall Arcade Java game make use of the hardware acceleration. Asphalt Urban GT 3D is developed using the Mascot Capsule v3 Java API, which does not use the hardware acceleration chip. Asphalt Urban GT 3D by Gameloft is a game in the racing genre and PowerBall Arcade can be placed in the puzzle action category. Asphalt 3D is the game for those who like driving cars and competing with computer controlled opponents. Select arcade mode to start instant play, free race, time attack or cop chase. The Championship mode let you save the progress between races and you will unlock new cars and tracks if you succeed. It is quite playable but the game fits in a 625KB Java file so don't expect Sony PSP quality. I found the cars in Asphalt Urban GT difficult to control at times. It was mainly because of the W900s 240 x 320 portrait display orientation. I often felt the view to the sides was too restricted. It is difficult to see where your opponents ahead are placed on the track and therefore difficult to know where to steer the car. Two control settings are available. One for the beginner with auto acceleration and the other one for more advanced drivers where you have to press a button to accelerate. You don't have to use the keyboard to steer because the W900 navigation button acts like 2, 4, 6, 8 keys. Most people have tried a race game before and should not have difficulties controlling the car after a few seconds. The other 3D accelerated game pre-installed is the PowerBall Arcade where the goal is to steer a rolling ball into bonus-gifts, pinball mode packages and collect boost power. Seems simple, but take ages to master. This is my favourite 3D game. Initially, 5 countries are selectable in addition to World Tour were you progress through them all. Many of the bonus packages are found on top of buildings and you need extra boost power to reach them. It’s difficult and requires practise to reach these. I feel this is the game that demonstrates the W900 3D hardware accelerated capabilities best. The Walkman application is the same as you find in Sony Ericsson W800 and Sony Ericsson W600/W550. This music application can run in the background while you do other tasks on the phone. W900 has 470 MB free internal memory for user data where it is possible to store the supported music files of the types MP3, AAC and WAV. 470 MB internal memory storage should be enough for over 130 files, but remember that pictures taken with the camera also make use of this storage. Because of this, it is likely that available memory will decreases over time as you capture more and more photos. Adding a 2GB extra Memory Stick PRO Duo card enables you to have a total of 700 melodies with you at all times. The Walkman application is a very simple but effective tool to organize your media. Melodies are automatically organized by artists and tracks but it is possible to create several playlists where only the favourite songs are included. 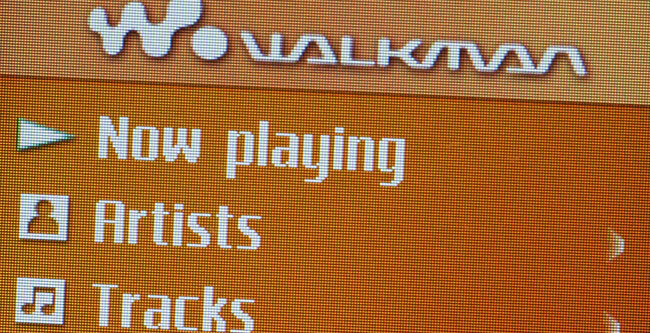 Video clips are also listed in the Walkman application and they can also be added to playlists. The Video clips can be one you have recorded with the W900 video camera, clips downloaded to the phone or video clips transferred to the phone from a PC. To transfer media to the phone you can (but don’t have to) use the included USB cable and the PC software Disk2Phone. The application let you select the files you want to transfer to the phone and convert them to MP3 before the transfer. It is very simple and it works well. The Disk2Phone will organize the music files in folders based on artist and albums. Sony Ericsson W900 does not have a radio application installed into the phone itself. You must connect the HPM-80 headset to listen to the radio. This is because the radio hardware is found in the HPM-80 and not inside the phone. You can’t even control any of the radio features from the phone. Everything must be done via the headset controller. The only reason I can think of why you need to connect the radio, is because the radio needs power from the phone. The radio will not work on other Sony Ericsson phones (K600, K750, W550) with the same connection interface. They will just report "Not supported". The handsfree wire is divided in two parts. The first one connects to the phone and has the radio and Walkman controller located in the middle. It has a microphone with a standard headset plug in the end. The second part is where the earplugs are found. The earplugs can be changed with your favourite headset or earplugs. This is ideal for music enthusiasts preferring to use their own high quality headset when they listen to MP3 songs. The HPM-80 has three buttons. The volume control is located on one side and the play button is located on the other side. When the Walkman application is active, the play button has four functions. Play, stop, forward and rewind. During radio listening, the button is changing purpose and control FM band seek. A light press to one of the sides change band frequency with +/- 0.05 MHz. Pressing the button completely in auto-tunes to the next station with Stereo reception. Press and hold for more than one second mute the radio. The power button is located on the front below the small LCD display. Its function is to power on and off and switch between the radio and Walkman. One of the main reasons why you would prefer to buy a W900 instead of W800 or the W900 little brother W550 could be of the 3G capabilities. Sony Ericsson W900 is the first Walkman phone that also offers 3G features. A small VGA camera is fitted just above the display directed towards the caller. One way to start a video call is to look up a contact from the address book and then select Make video call. The other is to click the dedicated Video call button located below the display. When a video call has started, a small live picture of yourself is visible in the bottom left corner of the display while the main part of the display shows a video stream of the person you are talking to. Press one button to switch the recording camera to the backside camera. This makes it easy to show the person you are talking to what you seing. Other features found is "share picture" where you for example can show the opponent a photography you have captured earlier. During a video call, it is possible to change video quality, switch to night mode, mirror image plus more. Doing video calls in noisy environments usually requires a Bluetooth- or a wired headset. W900 is no exception. Only one of the two loudspeakers is in function and that is sadly the one on the backside. It is nothing wrong with the loud-speaker, but because it is pointing away from the listener it force the user to use a headset. Sony Ericsson W900 comes with a couple of useful and not so useful Java applications pre-installed. The good old Java application Converter helps you convert meters to inches to feets etc. Distances, volumes, weights, temperatures, speeds and areas can be converted back and forth. Facewarp is a Java application where you capture photos of people and use the application to morph their face. Metronome must be a Java application for musicians with special needs. It is a collection three musical utilities: guitar chords, pitch and a metronome helping you keep the rhythm. Three non-Java applications are installed to help you create and edit new videos, pictures and ringtones. With VideoDJ it is possible to merge video clips together and select different transitions between the clips. You can add video clips, pictures and text to the new creation. The editing process is quick and easy to learn, but the generating of the final movie takes some time. PhotoDJ is a image editor where images can be edited using Pen, Line, Ellipse and rectangle tools. It is possible to add clipart, add effects like Auto levels, Tint, Negative, Cartoon style, change contrast and so on. The final result can be saved as a new filename. Lastly, the application called MusicDJ, also installed in older models from Sony Ericsson, makes it easy to create midi/polyphonic ringtones by mixing four instruments. The instruments has 32 different drum beats, 32 basses, 32 piano chords and 32 accents. You should be able to create completely unique melodies by combining these tones. One of the Bluetooth profiles found in the Sony Ericsson W900 is the Human Interface Device (HID). A handy application called Remote control makes use of this and transform the W900 into a PC remote control. Three HID profiles are pre-installed: Presenter for use with PowerPoint, Mediaplayer for use with Windows Mediaplayer and Desktop. Free custom made profiles for popular PC applications are available for download around Internet. The Desktop profile assigns W900 joystick movement to the PC mouse. 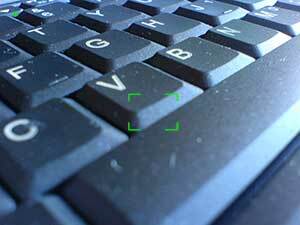 The W900 1-key acts like the PC-escape key, W900s 7-key become F10 and so on. Sony Ericsson continue to produce phones with infrared communication (IrDA). It is still older portable PCs using this type of communication but I have noticed a tendency where some manufactures leave out the IrDA and only ship models with Bluetooth. W900 has the latest Bluetooth protocol 2.0 built-in next generation of short range communication. USB connectivity is maybe the easiest and fastest way to communicate between a PC and the phone. The fast UMTS network connection also let you communicate fast with remove services and tools. The W900 has a useful feature called Update service which can be scheduled to check for firmware updates at regular intervals. This way you are sure the phone has the latest firmware and potential bug fixes installed. W900 has the latest Netfront XHTML browser installed. The full screen rendering feature is nice to have on such a relatively small size. You might also find the zoom in and out page feature helpful. Like all Sony Ericsson phones, W900 can be customized to suit every taste. Photos and downloaded images can be set as background image. Animated images can be used as screensavers. It is possible to download and change theme where most aspect of the phone menu, colors and visual look are changed. The phone support CLI (Caller Line Identification) which means that it is possible to add custom images and ringtone to all contacts. When there is an incoming call, a photo of the caller will be shown in addition to a MP3 melody associated with the contact. W900 is the largest phone from Sony Ericsson. Some might find it too large and wont like the swivel type. But it has every feature you can desire; 3G network support including video calls, it has 470 MB internal memory expandable with up to 2GB using Memory Stick PRO Duo, a 2 megapixel camera, 3D accelerated hardware supporting 3D Java games and a very good battery life compared to other 3G phones. The Walkman part just works without any hassle. I would guess that the average mobile phone user never make use of all W900 features. The user manual is a joke. It has only 40 pages of help instructions where seven of them are warnings and disclaimer of liability. No memory card include is a little disappointing but 470 MB internal memory is excellent. Business users might want a more sophisticated email client and calendar, but Sony Ericsson W900 will satisfy the demand from the average user.